I hit my listing goal this week. What I really need to start doing is exceeding my listing goal because there have weeks where I’ve fallen behind. If I am going to have any chance of actually hitting my big goal I need to make up some ground now. This week I listed 77 new items. 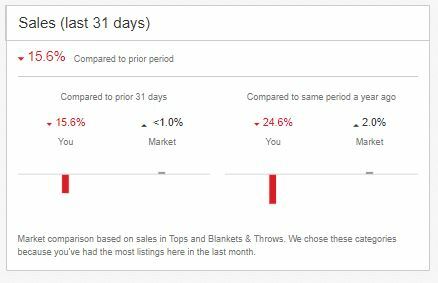 Since June 1 this puts my grand total at 443 new listings. 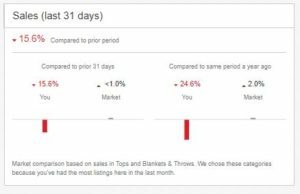 Sales this week are my worst in months. This whole summer has been pretty awful, but this week took the cake. I am actually feeling pretty discouraged about it all. I know last year sales were slow in the summer and picked up again in August. I am hoping that happens this year too, but I dunno. I really don’t know what to think. In addition to listing, I am also trying to keep up on getting my newly listed inventory put away. Also, keeping my tax info updated. Also, I am still updating my listings that are mysteriously missing photos. And I have been trying to cross post most of my new clothing listings to Poshmark. And hang out with my kiddos and have fun since they are on summer break. It’s a lot to juggle. Onward to a fresh new week! My summer sales are down too. Just remember that many big companies shut down these weeks for vacations. Should pick up in about 2 weeks when school shopping starts! Don’t get discouraged. All that hard work will pay off and your items will start flying off the shelves very soon!